St. Francis of the Lakes Catholic School. Our Children. Our Faith. Our Future. Every child is a unique gift from God. St. Francis of the Lakes Catholic School provides more personal attention to every student. Every child does better in an individualized and caring environment. At St. Francis “religion” is more than a subject. It is integrated into every aspect of our day through prayer, Christian formation, example, pastoral visits, active participation in Mass, stewardship and so much more. “The various school subjects do not present only knowledge to be attained, but also values to be acquired and truths to be discovered.” St. Francis offers an environment “in which faith, culture and life are brought into harmony”. We are leading our students to have a successful future. Academically, our students are ranked higher than the national average in every class and in every subject! This is based off the MAP Assessments. There are approximately 4,000 school districts representing about 4 million students using MAP. We are proud to show you our results. 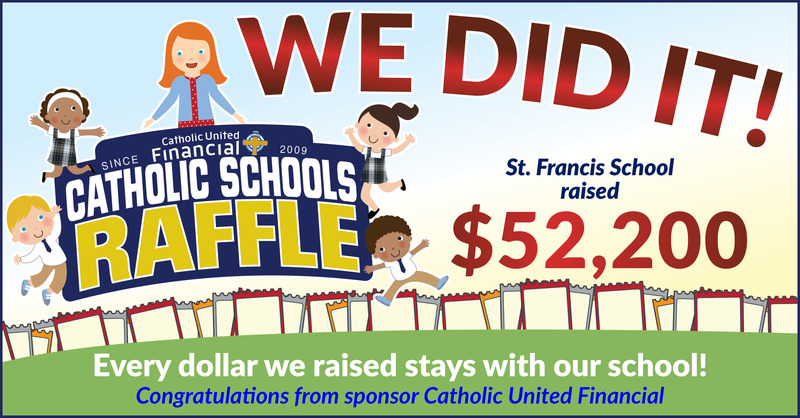 St. Francis of the Lakes Catholic School, in cooperation with and in support of the family, is committed to challenging students to grow spiritually, academically and socially within a Catholic environment. To learn more about the difference our Catholic School can make in your child’s life, contact us. St. Francis of the Lakes Catholic School admits students of any race, color, and national or ethnic origin. For your convenience click here for the 2018-2019 School Year Calendar. or click here for the 2019-2020 School Year Calendar. Registration is currently open for the 2019-2020 school year! Visit our registration page for more information and registration papers. Danny Hauer Basketball Tourney Final Game The Danny Hauer Basketball final tournament game will be Wednesday, April 17 starting at 1:40pm. The #1 seed, Jayhawks, will be faced with the #2 seed, Crusaders. Everyone is welcome to join us for this final match-up. Put together your garb, cause this night is sure to be rad enough for even Ferris Bueller to take the day off!!! TICKETS: Available now in church and school office or you can purchase tickets here online. Home and School Association (HASA) will be meeting at 6:30 on Tues., May 7 in the school Conference Room. HASA coordinates many activities through the school year and needs many volunteers to help facilitate. Check them out! Tours are always welcomed, we would like to show you around! You can also watch our school video. Please call us to set-up a time to come in, we look forward to meeting your family! Thank you everyone for entrusting your children to us! Remember to "like" our facebook page to see current photos of our students.